Have any of you heard of Bark Box? Last year I hit the bandwagon and subscribed to Birch Box. In my opinion it was a waste of money. I should have went with glam bag. My subscription is due to be up and I will not be renewing, but I do want to find another way to get a monthly package sent to the house. Even if it's not for me, it stills feels special! I was reading Christina's blog and stumbled upon this adorable box for pups! Her dog gets all kinds of cool stuff!!! It starts off as low as $18 a month, with free shipping. Upon sign up you will enter some information about your pooch, pick a frequency and then your on your way! I like how it is pet specific. Because not all of our fur babies are going to eat the same size bone! And some of my fellow blogger's dogs are the size of Graycie's toys! Plus 10% of it's proceeds, go to a rescue group! So check it out and let me know what you think! And if you are already a member of Bark Box , let me know how you like it!!! And if Bark Box wants to give me a free month trial, ya know, to blog about it and to write about how much my girl loves it! I wouldn't be impartial to that! What will they think of next? The "Birth Box" for all of the expecting moms. A monthly supply of chocolate and pre-natals! 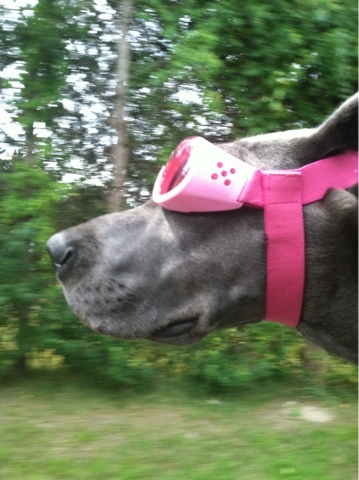 I'm honestly over here dying right now with her doggie goggles....OMG! HAHAHHAA! Sky wouldn't keep those on if her life depended on it! You may want to market "Birth Box" because I'm sure preggo's everywhere would LOVE that. I tried Beauty Box 5 and cancelled after my first bag. I was not happy. I got glam bag and love it. I saw this one and was wondering about it. Let me know how you like. I have 2 pups and they would be happy if I did this! 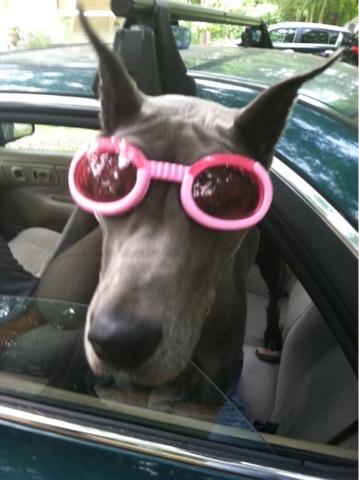 Those doggy goggles are so cute!! Omg... the goggles... LOL! So cute!!! I've looked at the Bark boxes and they are really cool! My dog might be small, but he's a monster as far as treats, bones and chewing toys. I wish he didn't destroy everything or I would totally get him a subscription!! !